Authorised Economic Operator (AEO) status is an internationally recognised quality mark which gives an organisation involved in international trade multiple commercial advantages and tangible financial efficiencies. 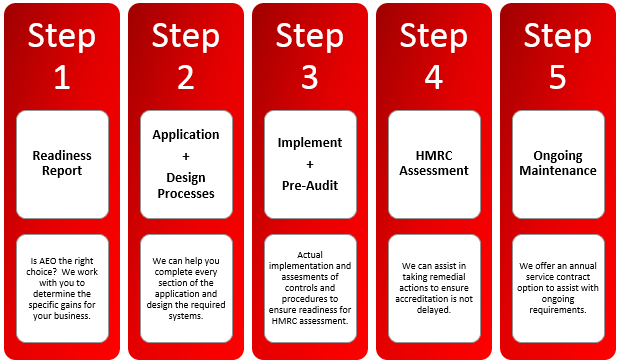 Our customs and AEO experts can help with every stage of achieving and maintaining the accreditation. All organisations that trade internationally should consider AEO accreditation. Specifically if you are a Known Consignor or Regulated Agent the application process will utilise existing systems, capitalising on your current investment in security. As a full AEO the business will have an international quality mark and benefit from financial savings on customs deferment guarantees and waivers from mandatory special procedure guarantees. Click here to see our AEO Information page for more details or click here for AEO requirements and application forms. Ascent Consultancy and Training can help with every step of acquiring and maintaining AEO status. We offer 3 tiers of service ranging from complete outsourcing of the process to light touch assistance when required. If you have already started the process we can help at any stage. If you have not yet considered becoming an AEO we can help with an initial discussion to help decide if it will benefit your organisation.